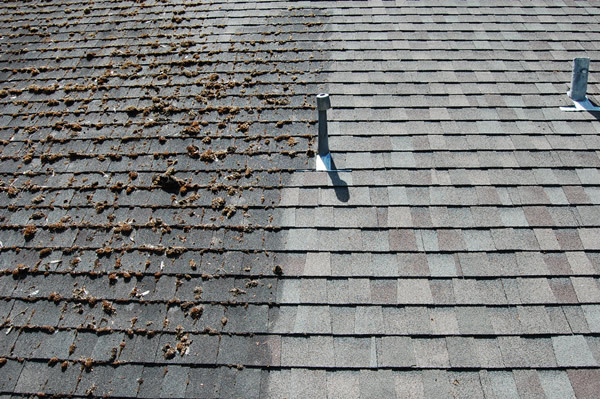 Avoid An Expensive Roof Replacement By Easily Removing Moss, Algae And Mold From Your Shingles! Feel confident knowing our product won’t harm your children, pets or landscaping! 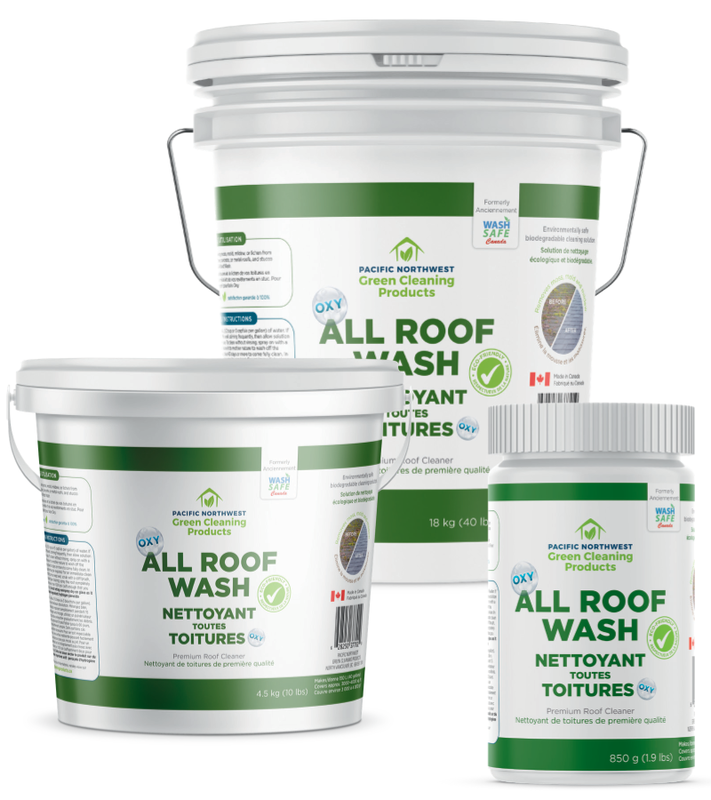 If you are looking for a safe, effective way to clean to clean stains or debris caused by algae and moss from your roof without harming your pets or your landscaping, our Roof Wash is exactly what you need. 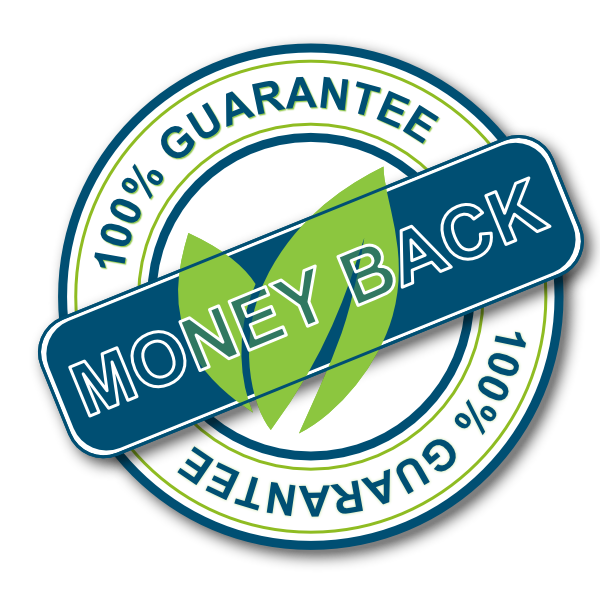 We field tested and perfected our formula over years in the roof cleaning industry and as the manufacturer, we stand behind the efficacy and safety of our product 100%. Ideal for removing moss, mold, mildew, or lichen from asphalt, tile, rubber, concrete, or metal roofs, and stucco siding. For wood shingles use Oxy All Wood Wash.
Add 125 ml of Oxy All Roof Wash (1/2 cup or 3 capfuls per gallon) to 4 L of water. If available, warm water dissolves best. Mix well, stirring frequently, then allow solution to fully activate for 15 minutes before use. To clean without rinsing, spray on with a garden style hand pump sprayer, and leave it to mother nature to wash off the debris. Damage is stopped, but it may take 60 days or more to come fully clean. In some extreme cases a second application may be required. For an immediate clean roof, apply to small enough sections that can be kept wet, scrub with a stiff brush, then rinse with a hose. For a professional type cleaning, spray the roof completely then rinse with a pressure washer set at less than 1000 psi (soft enough that you can put your hand in front of the nozzle). 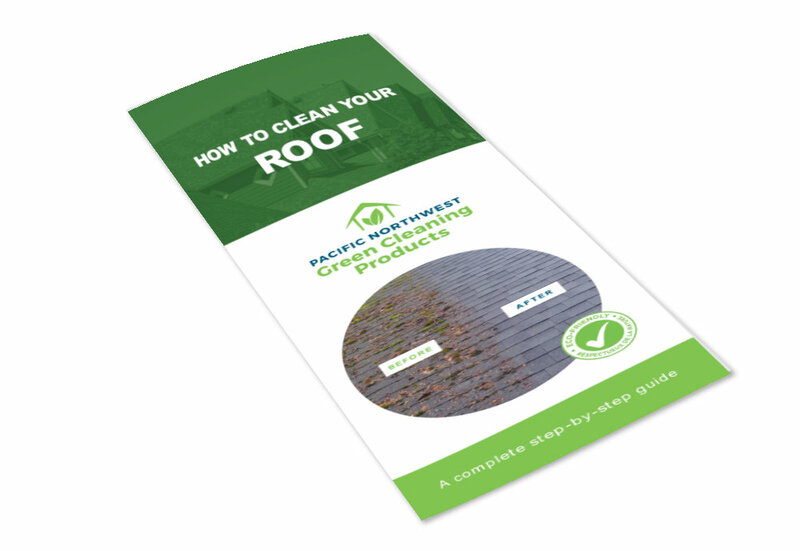 Check out how a dirty roof can actually put your home insurance in jeopardy! Click the bottom right corner icon to view the video in full screen. We operate in Victoria BC, solely using these great products for moss, dirt and algae removal. I’m confident that the products offered are superior to chemicals. A great alternative for the forward thinkers and respecting the environment. Doug is also very kind, offering advice and rapid replies. Thanks, Doug for contributing to our successful company and making our environment a top priority! After using two other products I tried Roof Wash and was immediately very impressed. The results were evident a very short time after the product was applied, and has continued to improve as the dead algae and lichens get washed off by the rain. I applied the product on a five year old cedar shake roof and it has obviously extended the future life of the roof. Just had my roof cleaned for the third time in nine years by Tims Solutions. Totally pleased by the product, the results and by Tim’s thoroughly professional service. I will be recommending him and your product to all who enquire. I’ve used it now for about 4 years. The first year I had a lot of moss and it took it all off with one application. Now I just use it for maintenance. Great to find a product that actually works as advertised. I have a large home with about 2000 sq feet of roof surface. I use a small BE transfer pump and mix the solution in a large garbage container then just spray it on the roof with a hose. Thanks again. Hey this is Chris Jackson at The Window Viper Glass Gutter Cleaning Service, on Vancouver Island. We started using Roof Wash on a regular basis this year and am very happy to have invested in the equipment to apply this product by truck mounted pump and reservoir.